Coining fabrication is a basic type of bending in which the workpiece is stamped between the punch and die. Both the punch tip and the punch actually penetrate into the metal past the neutral axis under a high amount of pressure. The term Coining comes from the idea that when it comes to money each metal coin is made exactly the same as the last despite being mass produced. From this idea the name Coining was applied to the bending method which creates accurate bends consistently. There are a few significant advantages to coin bending sheet metal, the first of which are high repeatability, precision, and the ability to reduce the inside radius to as small as desired. During the Coining process the material is put under enough pressure that the punch tip penetrates the material at the bottom of the bend and it begins to flow into the die. Because the sheet metal flows during the process of Coining the bend radius formed by Coining is always equal to that of the punch tip. The penetration into the metal also relieves the internal stress and is thought to be a contributing factor to the elimination of Spring Back. A final advantage of Coining is that this method does not require sophisticated CNC machines to execute. It does however very large tonnages compared to the other two bending methods, typically it will require 5-8 times the tonnage of Bottom Bending. Because of these tonnage requirements, wear and tear on the machines will be much greater than air or Bottom Bending. Tooling required for Coining must be robust and this can limit your tooling and geometry options. Because of the tooling restrictions and the large tonnages required to coin this process is rare in the press brake world. 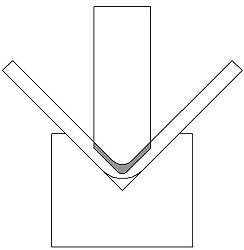 When determining the V-width for tooling it is preferable to use a v-opening of 5*Mt. This reduces the initial inside radius, before the punch tip begins to penetrate, and reduces the amount of metal the tip actually has to penetrate. The smaller v-opening also means that the surface area between the sheet metal and the bottom die is reduced, this increases the average tonnage per area on the inside of the v-opening, the keY-Factor in eliminating Spring Back. When selecting the tooling for a Coining operation the punch and die should have the same angle as the desired finished bend. Spring back is not taken into consideration when making this selection. If you desire a 90 ° bend you should select a 90 ° punch and a 90 ° die. The actual formulas for Coining are fairly simple as they are just based off of the formulas for Air Bending, modified for the affects of Coining. For the tonnage formula below I’ve given 7.5 as a multiplier, this may be higher or lower depending on the material you’re bending. The rule of thumb I use for this is the higher the tensile strength of the material the higher the tonnage multiplier. You should always start low and work your way up until you get the desired results. Use the Air Bend Force Chart to find your initial tonnage. You can also reference the tensile strengths for different materials below. V Opening = 5 * Mt.